The volume of approvals for new dwellings bounced back strongly in the month of November 2016, particularly on the multi-unit side, according to new research released by the Housing Industry Association. Source: HIA“The year 2016 was a record one for new dwelling commencements and this will ensure that the volume of residential building activity remains elevated over much of 2017,” Mr Garrett said. “However, we anticipate that new dwelling starts will decline over the next 12 months, with this likely to be felt on the ground towards the end of this year. "In November 2016, the largest increase in seasonally-adjusted dwelling approvals occurred in Western Australia (+24.4 per cent), followed by Victoria (+9.4 per cent) and South Australia (+7.1 per cent). The volume of approvals also rose in Tasmania (+5.2 per cent) and NSW (+5.1 per cent), while in Queensland, dwelling approvals fell by 4.6 per cent during the month. 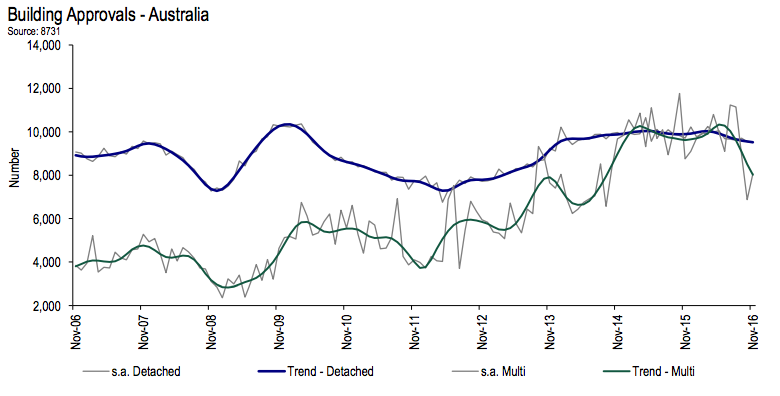 In trend terms, approvals declined by 5.1 per cent in the NT and were down by 3.4 per cent in the ACT.